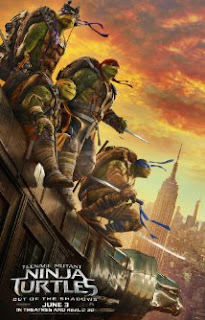 The Turtles save the city of New York during the night as in the title "out of the shadows" because if they are seen during the day they fear that they will not be accepted and may even be hunted. The leader of the four brothers is Leonardo (Pete Ploszek), the brains is Donatello (Jeremy Howard), the muscle is Raphael (Alan Ritchson), and the dumb one but with a big heart and youngest of the bunch is Michelangelo (Noel Fisher). Each one helps each other out and without teamwork they really begin to fail. They also have human friends and one certain gorgeous lady is April O'Neil played by the lovely Megan Fox. Although she is good to look at, she did not really contribute much to the film but has gotten better since her last couple movies. Another new addition (if you watch the CW's Arrow then you will recognize Stephen Amell) who plays Casey Jones, a correction officer dreaming of becoming a detective. Together, they are a team not to be messed with.